Stamping is a process that indents text into metal, providing a finished product that will not rub or wear off. Block style numbers and upper case letters are permanently recessed to provide one of the most long-lasting marked tags available. Stamping is a more cost-effective solution to metal marking than engraving, and can be produced quickly. 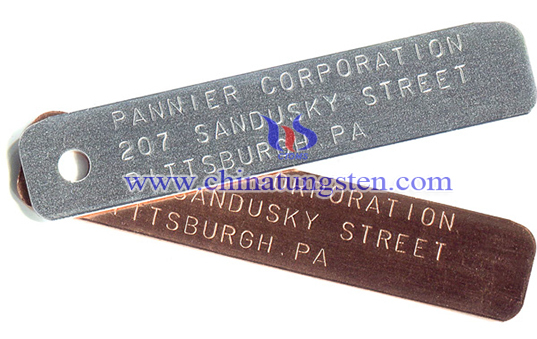 We offer custom stamped tungsten tag when customized tags are needed with characters. The stamped tags that we customize are available in a variety of sizes, shapes and colors. All tags can be stamped with identical data, or can be completely customized with unique information. 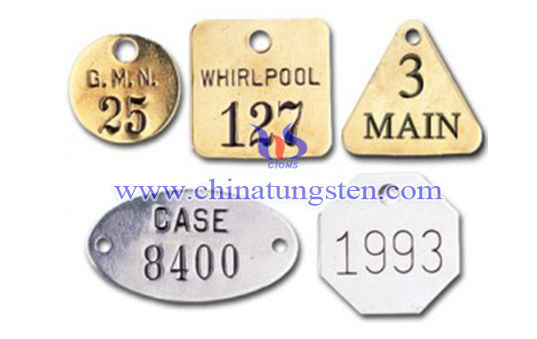 If you have any interest in custom stamped tungsten tag, please feel free to contact us by email: sales@chinatungsten.com sales@xiamentungsten.com or by telephone:0086 592 5129696.